Thanks to you folks who gathered on Earth Day to help clean up around the High School. What does timebanking mean to you? Sandy: Sharing individual talents and working towards a sustainable community. 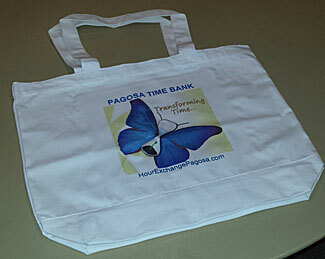 Get your sturdy Time Bank bag with the bottom that folds out for all your stuff. ONLY $12! Attend a potluck or contact Jennifer at 970-264-9358 to get yours today! You'll need to fill out an application and be accepted before attending Orientation. You'll receive an email and can schedule the two hour orientation (or software refresher) for a date and time that's best for you and the instructor! In addition to our monthly potlucks, Hour Exchange Pagosa (HEP) is stepping up to support the Farmer's Market. Timebanking is about sustainability and helping members find the help they need within the community. What better way to build community than supporting local growers who are providing us with fresh, organic food locally?! Therefore, HEP is offering one hour for every Saturday you choose to frequent the Farmer's Markett. That means there is the opportunity to earn 4 hours/month! The hours of operation are from 8:00AM-1:00PM at East Side Market. I recommend getting there early to ensure the best selection of produce. (Note: you do not need to help at the Farmer's Market, just shop there to earn your hour). This is a great place to spread the word about the timebank to others as well as a lively, fun, healthy gathering place. Look forward to seeing you there! We LOVE when new members join. Sign up today and get your needs and wants met without money!